Simón José Antonio de la Santísima Trinidad Bolívar y Ponte Palacios y Blanco (July 24, 1783 - December 17, 1830) was a South American independence leader. Credited with leading the fight for independence in what are now the countries of Venezuela, Colombia, Ecuador, Peru, Panama, and Bolivia, he is revered as a liberator in those countries—although the Bolivarian dream of a unified America never came to realization. Bolivar is known as "El Libertador," The Liberator. The Spanish crown had ruled its American colonies through vice regencies, with the former Aztec Empire, the former Incan Empire, and Buenos Aires being the three largest. One-fifth of all of the gold, precious stones and other wealth extracted from the Americas were the property of the King. The viceroys, who represented the King and were appointed for five year terms, and other key holders of power had to be not only pure Europeans but they had to have been born in Europe. Europeans born in Latin America were referred to as criollos or Creoles. Although they might accumulate great material wealth, they could not hold political office. This sense of political disenfranchisement, as well as Spain's insistence on being Latin America's only European trade partner, led to a growing sense of alienation and to the calls to follow the example of the colonies of North America by gaining independence from Spain. Although Bolivar has become known as the chief architect of Latin America's independence and was ceaseless in his dedication to independence and in his love for Latin America, he is often criticized for having focused too much on securing his place in history as the father of Latin American independence. Bolivar's own inability to build coalitions with other key players in Latin American independence such as Francisco de Miranda and, most importantly, with Jose Antonio de San Martin, the liberator, and "the Protector" of the Southern Cone helps to explain why, even before the end of Bolivar's life, Latin America had splintered into military-controlled fiefdoms, which would define Latin America's political evolution and legacy. The Bolívar aristocratic bloodline derives from Puebla de Bolíbar (also Bolívar or Bolívar, today part of the municipality of Ziortza-Bolibar), a small village in the Basque county of Biscay (Spain), and is the origin of their surname. A portion of their wealth by the 1600s came from the Aroa River gold and copper mines in Venezuela. By the 1500s, rumors about rich gold deposits around the rivers Yaracuy, Santa Cruz, and Aroa brought Spanish settlers, including members of the Bolivar family, to the region. In 1605, more precise locations of ores became known, particularly in a small valley lateral to the Aroa River next to La Quebrada de Las Minas. In 1632, gold was first mined, leading to further discoveries of extensive copper deposits. Towards the later 1600s, copper was exploited with the name "Cobre Caracas." These mines became property of Simón Bolívar's family. Later in his life as a revolutionary, Bolivar used part of the mineral income to help to finance the South American revolutionary wars although the British Empire was a prime contributor because of Britain's interest in gaining access to the rich trade opportunities in the region. Some people claim that the Bolivar family grew to prominence before gaining great wealth. For example, the Cathedral of Caracas, founded in 1575, has a side chapel dedicated to Simón Bolívar's family. Simón Bolívar was born in Caracas, in modern-day Venezuela, into an aristocratic family, and educated by different tutors following the death of his parents. Among his tutors was Simón Rodríguez, whose ideas and educational style heavily influenced the young Bolivar. Following the death of his parents, he went to Spain in 1799, to complete his education. There he married María Teresa Rodríguez del Toro y Alaysa in 1802, but on a brief return visit to Venezuela in 1803, she succumbed to yellow fever. Bolívar returned to Europe in 1804, and for a time was part of Napoleon's retinue. Bolívar returned to Venezuela in 1807, and, when Napoleon made Joseph Bonaparte King of Spain and its colonies in 1808, he participated in the resistance juntas in South America. Spanish America being placed under the auspices of a French ruler (even if he had assumed the Spanish crown) contributed to the distancing between Latin America and Spain. The Caracas junta declared its independence in 1810, and Bolívar was sent to England on a diplomatic mission. In July 1812, the independence movement leader Francisco de Miranda surrendered, and Bolívar had to flee to Cartagena de Indias. It is argued that Bolivar played a role in Miranda's arrest and that Miranda's disappearance from the scene contributed to Bolivar's ascent into the role as the key figure in Latin American independence. It was during this period, that Bolívar wrote his Manifiesto de Cartagena, calling for Latin American independence. 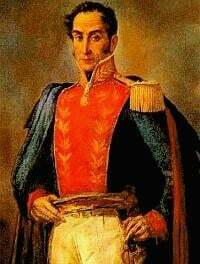 In 1813, after acquiring a military command in New Granada under the direction of the Congress of Tunja, he led an invasion of indepence forces into Venezuela on May 14. This was the beginning of the famous Campaña Admirable, the Admirable Campaign. Bolivar entered Mérida, Venezuelaon May 23, where he was proclaimed as El Libertador (the liberator from the Spanish army), following the occupation of Trujillo on June 9. Six days later, on June 15, he dictated his famous Decree of War to the Death (Decreto de Guerra a Muerte). Caracas was retaken on August 6, 1813, and Bolívar was ratified as "El Libertador," thus proclaiming the Venezuelan Second Republic. Due to the rebellion of José Tomás Boves in 1814 and the fall of the republic, he returned to New Granada, where he then commanded a Colombian nationalist force and entered Bogotá in 1814, recapturing the city from the dissenting republican forces of Cundinamarca. He intended to march into Cartagena, Colombia and enlist the aid of local forces in order to capture Royalist Santa Marta. However, after a number of political and military disputes with the government of Cartagena, Bolívar fled in 1815, to Jamaica, where he petitioned the Haitian leader Alexandre Pétion for aid. In 1816, with Haitian help (given because he promised to free slaves), Bolívar landed in Venezuela and captured Angostura (now Ciudad Bolívar). A victory at the Battle of Boyacá, in 1819, added New Granada to the territories free from Spanish control, and in September 7, 1821, the Republic of Gran Colombia (a federation covering much of modern Venezuela, Colombia, Panama, and Ecuador) was created, with Bolívar as president and Francisco de Paula Santander as vice president. Further victories at the Battle of Carabobo, in 1821, and Battle of Pichincha, in 1822, consolidated his rule over Venezuela and Ecuador respectively. After a meeting in Guayaquil on July 26 and 27, 1822, with Argentine General José de San Martín, who had received the title of Protector of Peruvian Freedom in August 1821, after having partially liberated Peru from the Spanish, Bolívar took over the task of fully liberating Peru. This meeting and the failure of Bolivar to involve San Martin in the final stages of liberation led to a division between the independence forces of San Martin that had effected liberation from the South beginning with Buenos Aires, and then Santiago and onward to Peru and Bolivar's forces that had traveled south from Venezuela to Peru. San Martin first asked Bolivar for military support in liberating the final Spanish stronghold in Peru. When Bolivar refused, San Martin proposed that they lead the forces for liberation together. When Bolivar again refused, San Martin proposed to fight under Bolivar and Boliar again refused. San Martin returned to Buenos Aires and then onward to Paris, lamenting that the ideal of Latin American indepedence had been lost. The Peruvian congress named Bolivar dictator of Peru on February 10, 1824, which allowed Bolívar to completely reorganize the political and military administration. Bolívar, assisted by Antonio José de Sucre, decisively defeated the Spanish cavalry on August 6, 1824, at Battle of Junín. Sucre destroyed the still numerically superior remnants of the Spanish forces at Battle of Ayacucho on December 9. On August 6, 1825, at the Congress of Upper Peru, the Republic of Bolivia was created in honor of Bolívar, who drafted a new constitution for the new nation. This constitution reflected the influence of the French and Scottish Enlightenment on Bolívar's political thought, as well as that of classical Greek and Roman authors. Bolivar accepted the position reluctantly, recognizing that it pointed to the splintering of Latin America. Equestrian statue of Bolivar on Bolivar Square, Caracas. Bolívar had great difficulties maintaining control of the vast Gran Colombia. During 1826, internal divisions had sparked dissent throughout the nation and regional uprisings erupted in Venezuela, thus the fragile South American coalition appeared to be on the verge of collapse. An amnesty was declared and an arrangement was reached with the Venezuelan rebels, but political dissent in New Granada grew as a consequence of this. In an attempt to keep the federation together as a single entity, Bolívar called for a constitutional convention at Ocaña, Colombia, during April 1828. He had seen his dream of eventually creating an American Revolution-style federation between all the newly independent republics, with a government ideally set-up solely to recognize and uphold individual rights, succumb to the pressures of particular interests throughout the region, which rejected that model and allegedly had little or no allegiance to classical liberal principles. Bolivar wanted to implement in Gran Colombia a more centralist model of government, including some or all of the elements of the Bolivian constitution he had written (which included a lifetime presidency with the ability to select a successor, though this was theoretically held in check by an intricate system of balances). This move was considered controversial and was one of the reasons why the deliberations met with strong opposition. The convention almost ended up drafting a document which would have implemented a radically federalist form of government which would have greatly reduced the powers of the central administration. Unhappy with what would be the ensuing result, Bolívar's delegates left the convention. After the failure of the convention due to grave political differences, Bolívar proclaimed himself dictator on August 27, 1828, through the "Organic Decree of Dictatorship." He considered this as a temporary measure, as a means to reestablish his authority and save the republic, though it increased dissatisfaction and anger among his political opponents. An assassination attempt, in September 1828, failed. Although he emerged physically intact, this nevertheless greatly affected Bolívar. Dissident feelings continued, and uprisings occurred in New Granada, Venezuela, and Ecuador during the next two years. Bolívar finally resigned his presidency on April 27, 1830, intending to leave the country for exile in Europe, possibly in France. He had already sent several crates (containing his belonging and his writings) ahead of him to Europe. He died before setting sail, after a painful battle with tuberculosis on December 17, 1830, in La Quinta de San Pedro Alejandrino, in Santa Marta, Colombia. 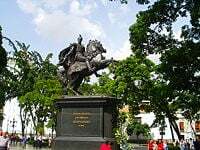 His remains were moved from Santa Marta to Caracas in 1842, where a monument was set up for his burial. 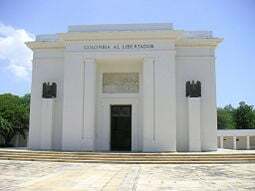 The Quinta' near Santa Marta has been preserved as a museum with numerous references to his life. 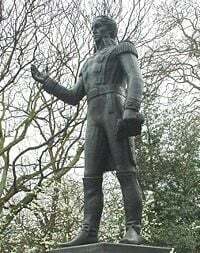 Statue of Simón Bolívar in Belgrave Square, London. On his deathbed, Bolivar asked his aide-de-camp, General Daniel Florencio O'Leary to burn the extensive archive of his writings, letters, and speeches. O'Leary disobeyed the order and his writings survived, providing historians with a vast wealth of information about Bolivar's classical liberal philosophy and thought. A great admirer of the American Revolution (and a great critic of the French Revolution), Bolívar described himself in his many letters as a classical "liberal" and defender of the free market economic system. Bolivar's defense of the free market system is understandable, given the tight control exercised on Latin America's markets by Spain. Among the books he traveled with when he wrote the Bolivian Constitution were Montesquieu's Spirit of the Laws and Adam Smith's Wealth of Nations. Bolívar's many speeches and writings reveal him to be an adherent of limited government, the separation of powers, religious freedom, property rights, and the rule of law. Nevertheless, Bolivar did not feel that Latin America was sufficiently mature to be ruled by such principles. Simón Bolívar has no direct descendants. His bloodline lives on through his sister Juana Bolívar y Palacios who married Dionisio Palacios y Blanco (Simón and Juana's maternal uncle) and had two children: Guillermo and Benigna. Guillermo died when fighting alongside his uncle in the battle of La Hogaza in 1817. Benigna Palacios y Bolívar married Pedro Amestoy. Their great-grandchildren, Pedro (94) and Eduardo (90) Mendoza-Goiticoa live in Caracas. They are Simón Bolívar's closest living relatives. ↑ Ricardo Silva, An introduction to artificial cavities in Venezuela during the colonial period, Centro de exploraciones espeleologicas de la Universidad Simón Bolívar, 1993. Retrieved March 22, 2007. ↑ Johannes W. de Wekker, La Quinta de San Pedro Alejandrino. Retrieved March 17, 2008. ↑ Find a Grave, Simón Bolívar. Retrieved March 22, 2007. ↑ Johannes W. de Wekker, Juan Vicente Bolívar y Ponte. Retrieved March 22, 2007. Bolivar, Simon. El Libertador: Writings of Simon Bolivar. Edited by David Bushnell and translated by Fred Fornoff. New York: Oxford University Press, 2003. ISBN 9780195144819. Lynch, John. Simon Bolivar: A Life. New Haven, CT: Yale University Press, 2006. ISBN 9780300110623. Masur, Gerhart. Simon Bolivar. Alburquerque, NM: University of New Mexixo Press, 1969. ISBN 9780826301314. Rio, Daniel A Del. Simón Bolivar. New York: Bolivarian Society of the U.S., 1965. Slatta, Richard W., and Jane Lucas De Grummond. Simón Bolívar's Quest for Glory. College Station, TX: Texas A & M University Press, 2003. ISBN 9781585448890. History of Simon Bolivar—Harvey L. Johnson. Excerpt from "Bolivar!" A Pat Daniels, History of Bolivar Peninsula and Life of Simon Bolivar. This page was last modified on 19 September 2015, at 15:42.